Charles Dickens usually wrote about his own time period, around the mid-1800s. He diverted from his contemporary setting in just two of his novels: Barnaby Rudge and A Tale of Two Cities. Being such an admirer of the Victorian era, I realized I had barely read any novels that depicted the 1700s. More specifically, A Tale of Two Cities is set during the years preceding and during the French Revolution. The French Revolution, of course, was a drastic event in world history and affected whole nations, not just France. Dickens writes astonishing descriptions of its effects in Paris as well as the French countryside, but the most profound message of what the Terror really did is told through a small, close-knit group of characters. Lucie Manette is the daughter of a Frenchman who is "recalled to life" after 18 dark years in the Bastille during the Ancien Régime. (I just realized the preceding sentence is rather ambiguous so I'll clarify that it was the father who was in Bastille, not Lucie Manette!) Soon after Dr Manette and his daughter are united (with the aid of Mr Lorry, a bank officer who remains an important character for the rest of the story), two men enter the picture. They are alike in looks and in their love for Lucie, but otherwise they differ greatly. Charles Darnay is a Frenchman of aristocratic birth who leaves his property and his country because he would rather go to exile in England and earn his own living than tax the peasants who are starving under the yoke. Sydney Carton, on the other hand, is an English barrister and habitual drinker who appears to have little respect for other people and absolutely none for himself. A Tale of Two Cities is the third Dickens novel I've read and in terms of style it is very different than Oliver Twist and Nicholas Nickleby. It contains much, much less humour and practically none of the sharp-witted sarcasm that I came to associate with Charles Dickens. The writer himself called it "the best story I have written", and I can wholeheartedly say it is one of the best stories I have ever read. For those who connect the word "epic" with boulder-sized books such as The Lord of the Rings and Les Misérables, this outwardly little novel of under 500 pages will be a bewildering surprise. Dickens uses absolutely mind-blowing descriptive language to create an almost disturbingly vivid image of a time period which he did not live. The violent mobs in both England and France become an unstoppable sea; the blood spilled at the guillotine becomes the wine that the "sharp female" drinks. 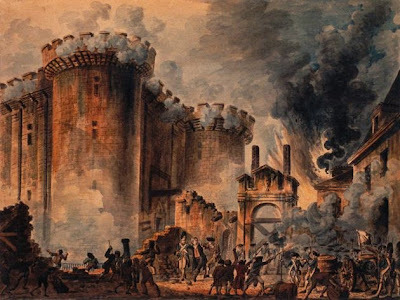 Storming of the Bastille by Jean-Pierre Houël. Dickens is often criticized for his one-sided characters and I sometimes agree with this. Even A Tale of Two Cities has its share of rather flat, uninteresting personalities. Charles Darnay is one, Lucie Manette is another. Dickens' main female characters in general tend to infuriate me. Usually they're either old, ugly hags like Mrs Corney in Oliver Twist, or they're like Lucie Manette, who makes me want to scream "Damn you Dickens, not another sweet, kind, innocent, beautiful lady who faints!" But there is something here to more than make up for Lucie Manette. We get to meet two other women who are among the best female characters in existence, for very different reasons: Miss Pross, Lucie's absolutely devoted companion who at first seems like a comical filler character but turns out to be something much more, and Madame Defarge, the wife of a wine-shop owner who is so ingenious that she manages to register details about a spy right under his nose but, little by little, turns into the personification of the mindless, violent rage behind the Revolution. Not only are these two women absolute treats by themselves, they even get an earth-shaking confrontation scene near the end of the book. This piece of dialogue is absolutely up there in the same rank as Valjean vs. Javert, Macbeth vs. Macduff, and other legendary confrontations. What makes it really intriguing and epic is that Miss Pross and Madame Defarge speak different languages and and neither can understand what the other is saying! It would be a crime to write this blog post without mentioning Sydney Carton, the man who looks almost exactly like Charles Darnay, but who has at least fifty times more depth. Like Nancy in Oliver Twist, he changes dramatically as a character, which I did think at times happened rather quickly and without much explanation. I really enjoyed reading the careless, cynical Sydney Carton in the beginning of the novel, but also looked forward to getting some explanation how he ended up like that – which I never got. Still, his dialogue with Mr Lorry is one of my favourite parts of the book, and the sacrifice he has to make at the end of the story troubled me even more than Nancy's fate. I have to agree with Indigo Montoya and say that Sydney Carton's thoughts at the end of A Tale of Two Cities are a near-guaranteed tear-jerker – even I cried over that. Many passages in this book were deeply moving in different ways, and I will share some of my favourite quotes. The first one is the opening lines of the novel.